Once a year the Central Saint Martin’s BA students put on a their graduation fashion year. Past graduates include Molly Goddard, Richard Quinn, amongst others. 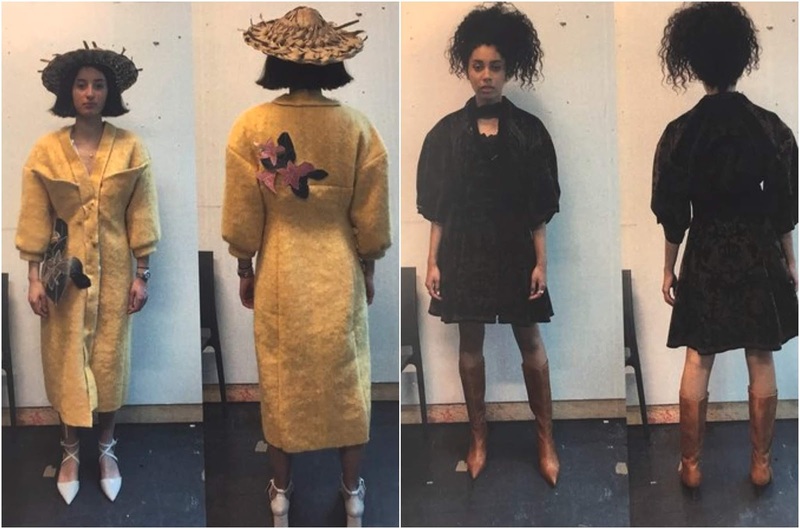 2018 featured 41 students’ collections from across all five pathways—womenswear; menswear; knitwear; print; fashion design and marketing. As always there was what can only be described as an explosion of colours, ideas (some original, some pastiched), gimmicks and glitter galore, experimentalism on ecstasy—the kind of work that inspires a paroxysm of disbelief and fury from the conservative commentators at the Daily Mail. One of them was Courtney Anne Mitchell. A London-native, Mitchell grew up in Maidenhead. She knew fashion was her calling when she was a young girl, drawing dresses and dressing dolls. Her work didn’t hold the audience captive because of awe-inspiring ostentation but for its sherbet colours and sophisticated approach to Sunday dressing. It was refreshing to see something with a sense of refinement. It’s often said that the tutors at Central Saint Martins insist upon experimentalist expressions, which usually wind up overwrought and comical in their eccentricity; Despite those being favourites from upstanding publications, the simplicity and soigné chic of Mitchell’s work was truly worth commending. Mitchell doesn’t intend to work to launch a namesake label anytime soon as she prefers to work in a group environment—perhaps something she developed when she interned at Paul Smith. With the level of skill exemplified at BA level, it’s evident that whatever design house recruits her, they’ll be making an investment. I caught up with her to discuss fashion education, the problems facing the fashion industry, and her graduate collection. 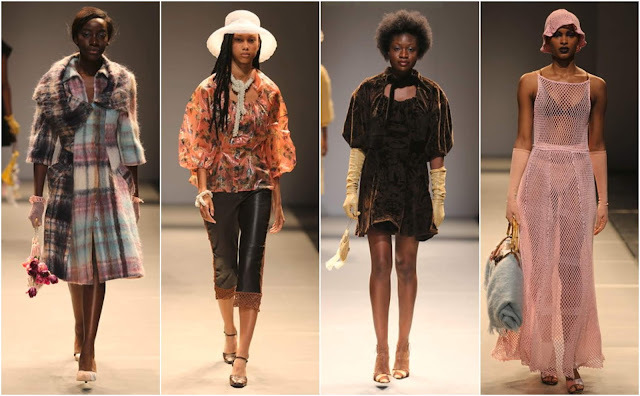 There is an oversupply of fashion graduates, according to the survey The Business of Fashion conducted last year. Is this something you and your classmates were thinking about? Speaking personally, it isn't something I have considered that much recently. I knew going into this course that there was an oversupply of fashion graduates and just generally people who wanted jobs in fashion. I have thought about it now and again over the past few years, mostly in questioning whether the fashion industry actually needs me. There is such an immense amount of fashion being churned out constantly, so I did consider whether me becoming a designer would just contribute to an already too-large industry. Perhaps, at-times, a pessimistic way of looking at fashion. The past year; however, has been so busy that I haven't even had the chance to consider being a fashion graduate. The collection put me into survival mode and I had to break down the bigger picture into small manageable steps. Each small deadline became my main focus and I was just constantly putting one foot in front of the other to make it to the finish line. Now that the finish line is on the horizon though it does become a bit scarier, that I will have to find a job and that I will be thrown into a pool of graduates with amazing portfolios all applying for the same jobs. So I guess its a bit of a yes and no answer. Do you think competitions at fashion college are good preparation for the future, i.e. the L'Oreal prize etc? I am not sure that the prizes necessarily prepare one for the future, but it is a great way to recognise students who have worked ridiculously hard to produce collections. Of course it is an amazing addition to the CV so it cannot harm one's future in any way! 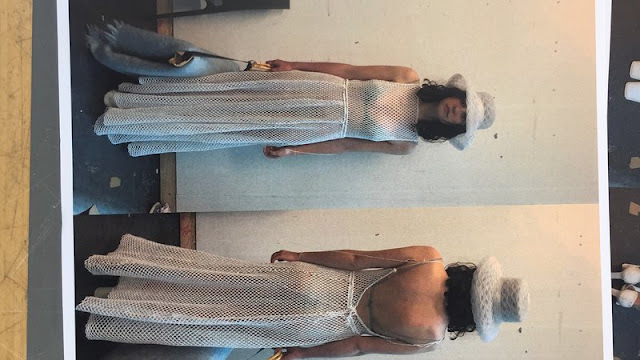 Your graduate collection was presented at the Press Show last week, can you tell me about your inspirations and the process of making it? 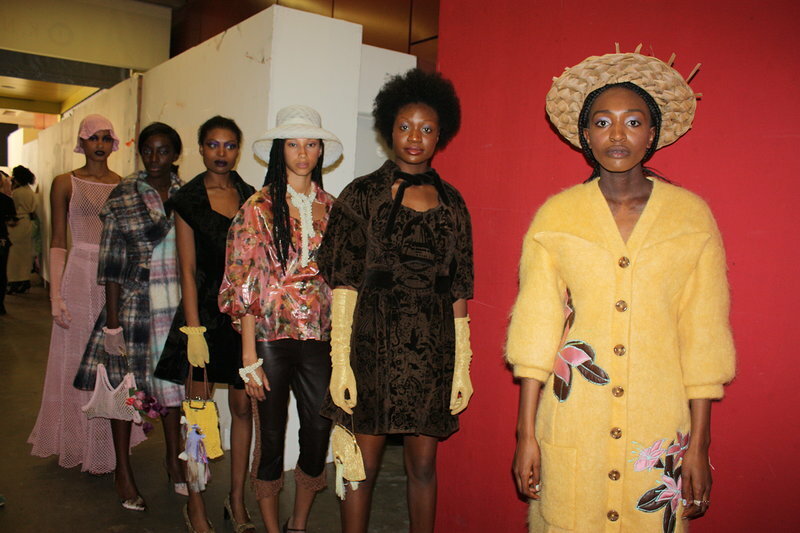 My collection was mostly inspired by my grandmother, but I guess within her personal story is a bigger story that many women like her can relate to. I had started recording conversations with her (she still doesnt know this; I am a terrible granddaughter) during my placement year, asking her about what it was like when she moved to England from Jamaica in the 1950s. I did this purely for myself - to have some sort of evidence of her life as there are so many questions I wish that I had asked my grandfathers before they died. She kept bringing up this supposed friendship she had with Princess Margaret in the 1960s when my granddad worked at Kensington Palace polishing doorknobs and working in the kitchens. I became obsessed with trying to ascertain whether these stories were in any way real and was struck with how similar yet different the two women were—both women are notoriously rebellious and mischievous. More broadly, I was interested by the complex relationship between the Commonwealth and the monarchy. People like my grandmother idolise the monarchy, were taught that England was the 'Motherland', were asked to uproot their lives to England to strengthen the workforce, but were treated as outsiders once they arrived. (These are the same people who very recently were being deported, detained, refused healthcare due to their apparent lack of British citizenship). Early on, I had to accept that this complex story would not be able to be spelled out in a 6 look collection, so I started off quite simply trying to capture the essences of the two women and their backgrounds. I started with print first, and I developed a laser engrave print that could bring the two worlds together. I had been looking at the patriotic, nationalistic tattoos captured by Martin Parr in some of his photography and started thinking of the idea of telling the story through tattoo designs. My grandfather had a few tattoos, I think one was a panther and maybe another an anchor, but I could never tell what they were because they were so faded and blotchy - I initially wanted to recreate this with a devoré burn-out on velvet to mimic flocked wallpaper at my grandma's house and at Kensington Palace, but ended up doing a laser engrave. I drew all these old-school style tattoos digitally on the computer, placed them on the pattern pieces and had them etched into cotton velvets. I also raided my Grandma's wardrobe, whilst recording her commentary, picking out and photographing clothes that she loved to wear or the clothes that she had made herself. 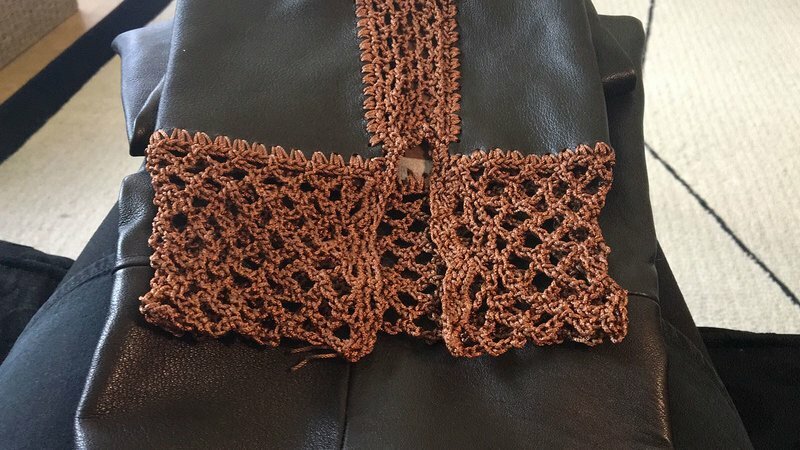 She loved to sew, knit and crochet so she has an abundance of really interesting self-made clothing. 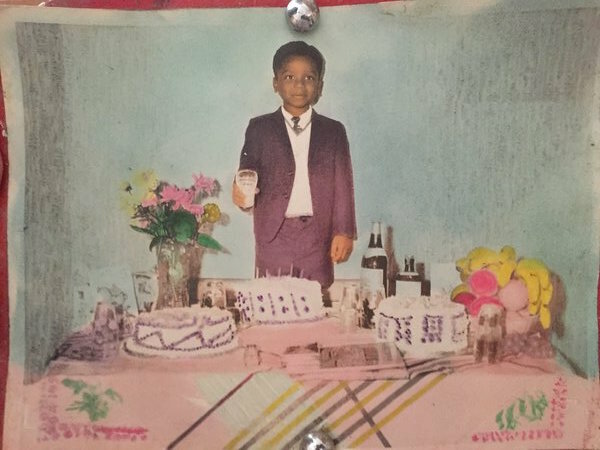 I also went through old photographs belonging to my grandparents - the colour scheme for the collection came from this one recoloured black and white photograph of my uncle as a child at a birthday party. For the Princess Margaret side I went through books on royal tailoring (mostly Norman Hartnell), vintage brochures documenting her life events, watched old newsreel of her visits to commonwealth countries and watched every documentary under the sun - I really wanted to feel like I understood her as best as I could. Aspects of the collection like the mohair came from this cardigan my grandma always wears, whereas certain design details like silhouette and necklines came from Princess Margaret's clothing. Essentially I had all these elements from these two different muses and I just smashed them together, instinctively picking out elements I felt fit my narrative. Do you think more of an emphasis should be placed on business education in fashion colleges? We get pretty much no business education on our course at our university, so I do not really know any different. 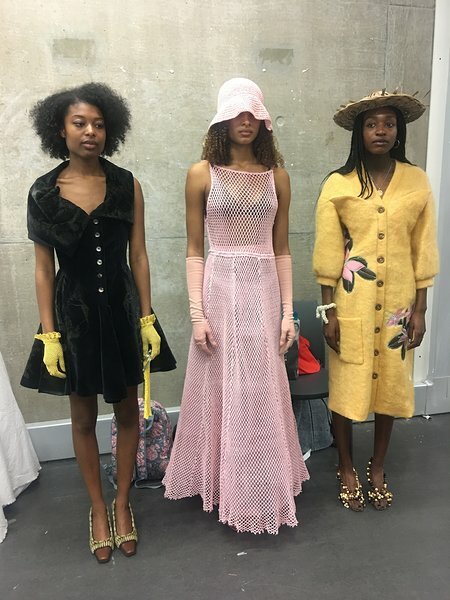 I do think though that at Central Saint Martins there is such a wealth of people (both tutors and students) with business experience and industry connections who can offer advice and guidance, even after graduation and that is perhaps worth more than a formal education in fashion business. What do you think are the biggest problems plaguing the industry and what would you think could be a remedy? I think sustainability is the biggest issue at the moment. There is so much new stuff being released constantly and if you go into any high street clothing shop, they have an immensely varied range of clothing - it is really overwhelming. All those clothes require so much energy and raw materials to produce. I really struggle now to buy brand-new clothing and try to get most of my clothes second-hand - charity shops are full of beautiful clothes in amazing condition waiting to be worn. Making my graduate collection often felt like such a waste, the amount of calico used in toiling, the amount of packages I was being delivered from around the world - my carbon footprint alone must have been huge. I did try to reduce the amount of new fabrics I bought - my mohair fabrics were actually blankets I had bought second hand on eBay, but on the whole I wish that my collection had been more sustainable. I think we need more education in sustainability, our university is really trying to educate us, but I certainly am unsure of how a compatible the fashion industry as we know it is with any current solution to the sustainability issue.